Last week, our Director of Research and Development sent out an e-mail about an upcoming professional development opportunity. Our school is planning to send a team to a conference this summer, and interested parties were invited to apply to be a member of the team. The topic: Design Thinking. Now this is something that I have been interested in for a while. Unfortunately, I am already presenting at two conferences this summer bookending a family reunion around the same time, so I am unable to attend. Now I am not one to miss out on anything, so after thinking about it for a while, I decided to challenge myself to learn more about Design Thinking on my own by August than I would be able to were I to attend the conference in July. I was going to farm my information from three main sources. First, my Twitter feed. I am currently following around 300 people, most of whom post frequently about education reform, innovation, edtech, and/or research in science. I typically devote about an half and hour to an hour a day flipping through my feed using the Flipboard app on my phone and iPad. The plan: save all articles dealing with Design Thinking to Instapaper, or bookmark it on Pinboard with the tag designthinking. I can also tag all of the articles saved on Instapaper, as all unread items feed into my Pinboard. and replace YourSearch with the term (no hashtag). All of this can be saved for a day when I have devoted time to learning about design thinking. Google Reader is the source that ties it all together. A triangulation of everything really. I can subscribe to blogs and resources about design thinking. I can also look through articles that have been tagged with designthinking via the RSS feeds I created from Pinboard and Twitter. As you can see, these three main tools that I plan to use are completely interconnected. It might sound complicated, but with a little juggling practice, the management of it becomes rote. In the end, I am able to capture and store information from an infinite number of sources, most of which I will be encountering for the first time when I finally sit down to digest the information that I have bookmarked and saved. Then one morning while flipping through my Twitter feed, I heard the bad news. The initial reactions of people across the globe were not promising. Almost immediately, the subtitles for the famous scene from the German war film, Downfall, when Hitler realizes that he has lost the war were rewritten to reflect "Hitler's" reaction to the death of Google Reader. "How dare they take away Google Reader, I have over 300 feeds in there! " "Do they have any idea how much effort went in to collect my feeds?" I must admit, I certainly identified with these sentiments initially. Removing any one of my carefully interwoven sources would surely mean complete failure of the system that I had developed. However, after reading a few posts from bloggers (that I follow on Google Reader :-), and taking a closer look at the links in my system, I realized that I had doubled back on my three main resources to allow me the mobile flexibility that I desired. Essentially I had covered all of my bases. I then arrived at the conclusion that with minimal effort on my part, the transition will most likely be seamless. Fact: Several third party RSS feed readers prophesied the end of Google Reader, and have already cloned the Google Reader API. Feedly, a free RSS reader, did just that. Check out this post about their development in preparation for the transition. As you can probably tell, I like to cover my bases. So this morning, in less than 10 minutes I signed up for a free account and transfer all of my feeds from Google Reader to Feedly (just in case Caffeinated doesn't pull through by July 1st). I have to admit I like the interface a little better than the one for Caffeinated. The one major drawback for me is that I can't directly tag posts and bookmark them in Pinboard, which is something that I can do with Caffeinated. If this is not an issue for you, you should check out Feedly. 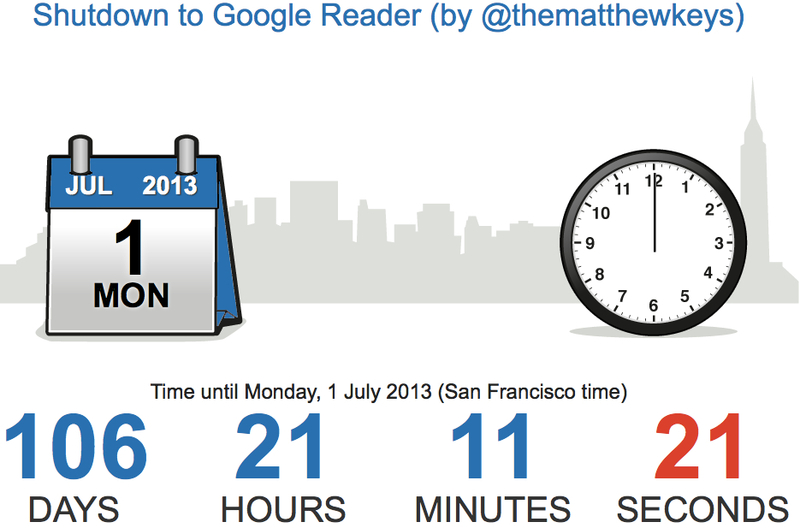 Regardless, I now realize that although Google Reader is going to disappear, my RSS feeds will not. The API will just live on in a more aesthetically pleasing form like Normandy. Now that the Google Reader is stepping aside, I am hopeful that both Feedly and Caffeinated with evolve to include the improvements that I am looking for in a reader by July 1st, and my biggest dilemma will be which one to choose! For a positive spin on this period of transition, you might want to follow Marco Arment's blog. He has written several posts about RSS feeds and readers since the news broke. I would also recommend listening to his recent podcast called Negativity, Skepticism, and Doubt, as it was very informative. As for me, I am going to get back to building my collection on Design Thinking. I can rest easy knowing that my system won't break down any time soon.